Whenever I have cravings I usually let them simmer in my mind for a good amount of time while deciding how best to indulge in them. Most of my cravings have been the direct result from hearing about food someone ate, or seeing food on TV. Last week it was no different. When Leila tells me about these calzones she and Josh had for dinner one night, the idea of eating calzones buried itself deep inside my brain. Over the next few days pictures of calzones ran through my head on repeat. I imagined them stuffed full of herbed veggies, or saucy and filled with ricotta-like crumbled tofu and non-dairy cheese like my mom used to make us when we were kids… but what really stuck with me was the idea of sticking spicy italian sausages into them, making a spicy tomato sauce, and finishing it out with some shredded mozzarella. Finally by the end of the week, I knew I couldn’t wait any longer for some calzones. I was so excited to make these and have them go into my stomach that I’ll admit I skipped over some of the more important parts, like getting thorough step-by-step pictures for you. Or getting pictures of them as they came out of the oven, hot and puffy. Even when I cut into them and sauce and cheese was oozing slowly out with melty goodness, I somehow couldn’t pause for long enough to snap any winning shots before digging in. I did snap a few pictures the next morning, but otherwise you’ll have to forgive me this time for lack of focus on the photography. Instead let me convince you that if you too make this dish, eating it will also become your #1 priority! The few shots I’m including are mostly thanks to Nathan, who was kind enough to not only knead the dough but also take pictures of our work. My cat, Minx was also a keen observer, though I didn’t let her get too close to the cooking or eating. These calzones are still on my mind. The next day, while taking a bike tour of Hyde Park with my friend Marty I couldn’t stop talking about my calzones. Seriously, ask him. 1. Proof the yeast: dissolve the yeast and sugar in the hot water, let stand 5-10 minutes until frothy. 2. In a large bowl mix the flour and salt. Then add the proofed yeast, sour cream (or yogurt), and olive oil. Stir together until it begins to clump, and then turn out onto a clean, floured surface and knead for 7-10 minutes until the dough becomes smooth and elastic (if you have a stand mixer, feel free to use it here!). 3. Place the dough in an oiled mixing bowl, cover and let rise in a warm place for an hour, or until doubled in size. 1. Mix all dry ingredients together: vital wheat gluten, chickpea flour, nutritional yeast, paprika, oregano, crushed red pepper, salt, cayenne, and thyme. 2. Add the wet ingredients: mashed pinto beans, vegetable broth, olive oil, soy sauce, and garlic. 3. Mix together with your hands until a wet dough has been formed. 4. Divide the dough into 4 equal portions. On pieces of aluminum foil, approximately 5″ wide, shape the dough roughly into logs. Roll the aluminum foil around the sausages and twist at both ends. 5. Bring a pot of water to a boil and steam the sausages for 40 minutes. 1. Saute the onions, peppers, and garlic in olive oil for 5-8 minutes. 2. Add the crushed tomatoes, spices, and broccoli florets. 3. Simmer for about 10 minutes, until broccoli has softened (though some crunch is still fine) then set aside. Pre-heat the oven to 500 °F. 1. When your dough has finished rising, roll it out so it is about 1/4″ thick. I broke the dough into 3 pieces to do this so I wasn’t rolling it all out at once. 2. Cut the dough into circles (can be more oval-like), about 10″ in diameter. 3. 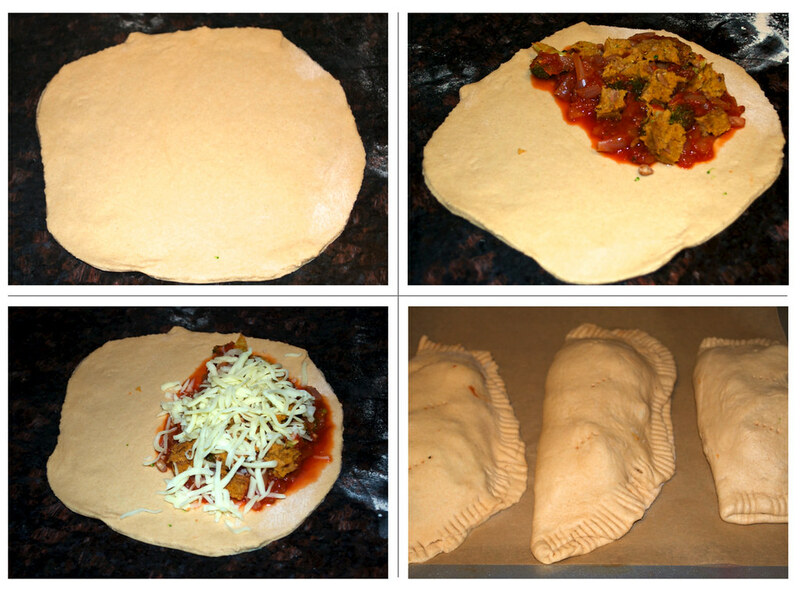 Fill half the dough with sauce (about 1/3 to 1/2 cup), the veggie sausage cut into bite sized pieces (I used slightly less than half a sausage per calzone), and mozzarella (1/4 to 1/3 cup or as desired). 4. Fold the dough in half and crimp the edges closed with a fork. 5. Carefully transfer (it can be tricky to not break the bottom of the dough, especially if your sauce is hot and softening the dough, I found it easiest to transfer with my hands and to only use the sauce when it had cooled to room temperature) to a baking sheet lined with parchment paper. 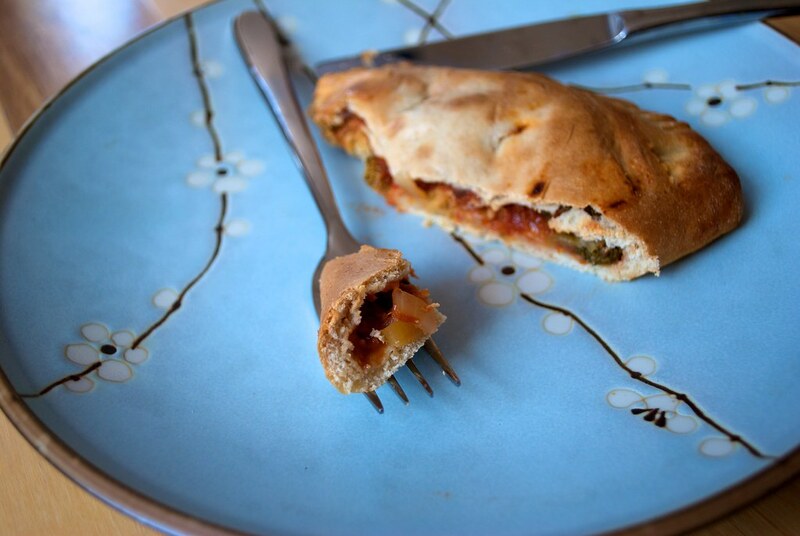 Poke a few holes in the top of the calzone with a fork. 6. Once you have made all the calzones, stick the baking sheets in your oven and bake for 10 minutes until the crust is a golden brown. This entry was posted in entree and tagged broccoli, calzone, recipe, spicy, tomato sauce, vegan. Bookmark the permalink. Interesting with the broccoli in the tomato sauce…thanks, I am now craving calzones! P.s. 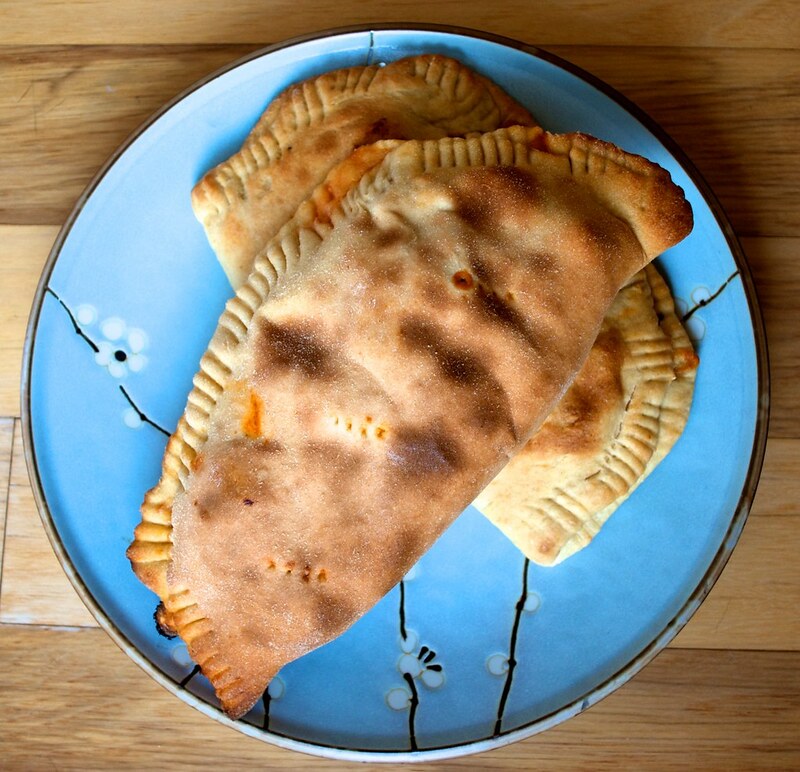 I find that with calzones, if you so desire, you can make them look really pretty by cutting three slits with a knife, instead of poking holes. Downside is the occasional oozing out, but the dough puffs up really nicely around the slits. Great recipe! I like that last plate with thw cherry blossoms. I almost bought those plates too! I am sure your craving is satisfied now. Thanks Noelle! My little sister (Sindha) gave me that plate for my birthday this year! The calzones really did hit the spot, but I might continue to crave them every time I look at pictures of them.. Thanks for the great idea, and for the link. I’ve been wanting some sausage lately, but don’t want to foot the price for some Gardein’s. 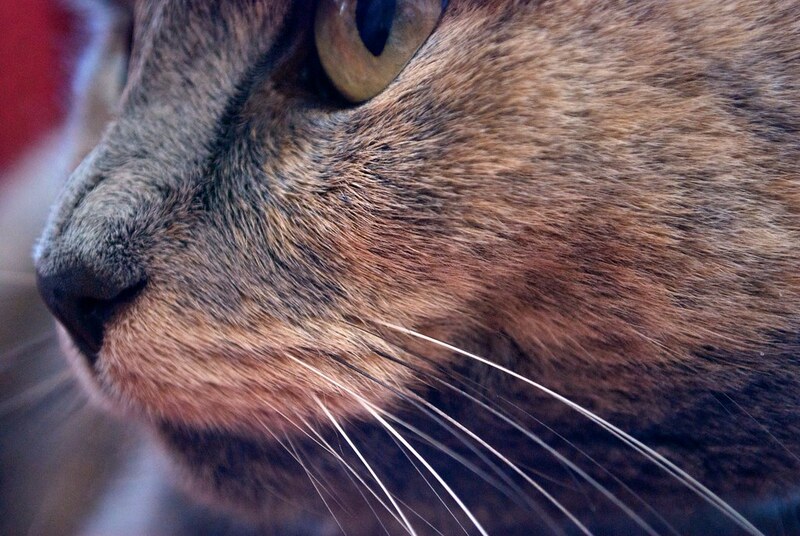 Love your kitty…did you zoom in or did she let you get that close without turning to look at you? Thanks Jessica! Homemade veggie sausage is super easy and delicious–definitely the way to go. My cat is used to being the subject of my photos and can be pretty good at ignoring me. I definitely got within just a few inches of her face for this shot. She’s a good kitty! I’ve recently been making calzone myself, for the first time. I make up a big batch of dough and let it do the first rise. Then I portion it, taking what I need for immediate cooking, and freeze the rest. Such a yummy, easy dinner. I just made these for dinner and ate two of them in ten minutes…omg they were so ridiculously yummy. I followed the recipe exactly except I used Upton’s vegan italian sausage (locally made :D) because I was short on time and I also used daiya cheddar instead of mozzarella…soo good thank you so much for this recipe! The dough was also really awesome with the yogurt, I used half whole wheat flour and half all purpose and it turned out healthy tasting without being gritty or overly dense. mm I like Upton’s products. I’m glad you enjoyed the recipe Alexx!